There are many great reasons for adding a pergola to your patio, deck, pool area, lawn, or garden. Pergolas can be used in different ways to expand your outdoor space, creating focal points in your yard. Pergola design had remained unchanged for years until technology made operable pergolas a possibility. But what’s the difference between an operable pergola and a traditional pergola? We’re glad you asked! A pergola is an outdoor structure made up of columns, which supports a latticed roof. They can either be attached to the house, acting as a transition from home to garden, or free standing. 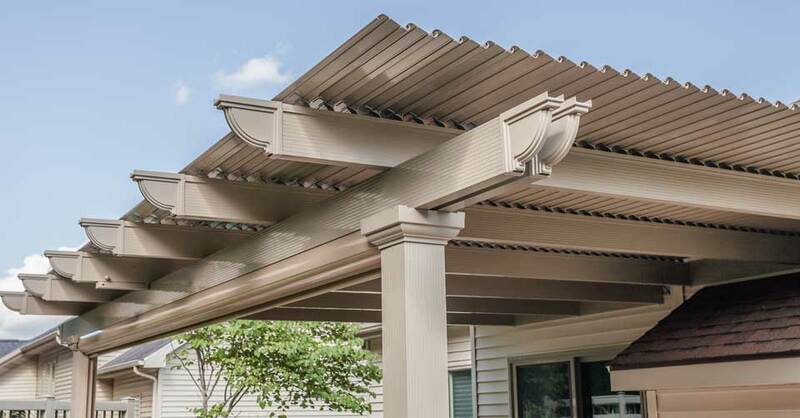 Pergolas differ from gazebos, covered porches, and other external structures because they have a semi-open roof; they are not intended to provide 100% protection from the elements. Operable pergola designs are different. Rather than a permanently open roof, the slats can be left open or closed depending on your need for sun or shade. They give you more flexibility in the use of your pergola, allowing you to make your environment more suited to your tastes. Being able to close the roof also gives added protection from the elements. If you’re outside relaxing or entertaining under your operable pergola and it starts to rain, simply close the roof for total protection! Pergolas are multi-use structures. They can provide a focal point for your yard or garden or bring shade to a deck or patio. They allow you to express your personal style. You could choose to fill them with furniture or make them the backdrop for plant displays. The lattices of pergolas make a great place for hanging plants. Just make sure that you choose the right type of plant to hang under your pergola. You don’t want a plant that needs full sun when traditional pergolas provide partial shade. You’ll also want to make sure that the planters won’t interfere with the operation of an operable pergola. Although pergolas are usually open-sided, you can create a more private area by adding sides. It’s your choice whether that is a solid side, or it contains a window for interest. It’s also possible to use a trellis and grow plants up it to create the feel of privacy without cutting out any of the light. With the possibility of opening the roof, an operable pergola is a great choice for a fire pit. Surround the area with comfortable chairs, dot around a few cozy throws and add your fire pit. Then just sit out and extend the evening with the warmth of an open fire. Enjoying the babble of water is relaxing, so why not add a water feature to your pergola. You can then sit in the sun (or shade) and enjoy the outdoors while you take a well-earned break from the stresses of life. With the option of a covered roof, an operable pergola will help prevent your water feature from getting clogged up with leaves and other debris. Making the right choice when it comes to your pergolas is essential and it can help to have the right support. Our customer service team would be happy to take your call and discuss your requirements, so you can relax and let us build your perfect pergola — whether operable or traditional.